Io's dayside is deliberately overexposed to bring out faint details in the plumes and on the moon's night side. The continuing eruption of the volcano Tvashtar, at the 1 o'clock position, produces an enormous plume roughly 330 kilometers (200 miles) high, which is illuminated both by sunlight and "Jupiter light." The shadow of Io, cast by the Sun, slices across the plume. The plume is quite asymmetrical and has a complicated wispy texture, for reasons that are still mysterious. At the heart of the eruption incandescent lava, seen here as a brilliant point of light, is reminding scientists of the fire fountains spotted by the Galileo Jupiter orbiter at Tvashtar in 1999. The sunlit plume faintly illuminates the surface underneath. "New Horizons and Io continue to astonish us with these unprecedented views of the solar system's most geologically active body" says John Spencer, deputy leader of the New Horizons Jupiter Encounter Science Team and an Io expert from Southwest Research Institute. 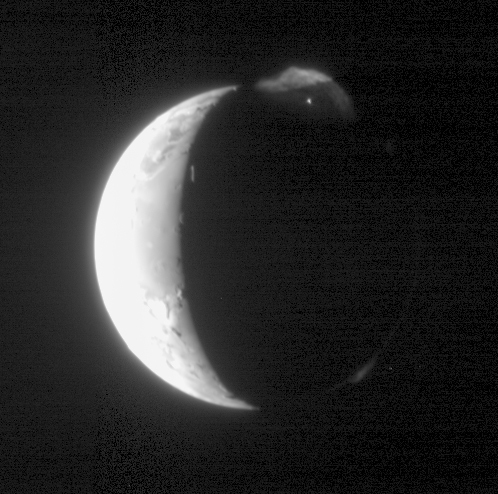 Because this image shows the side of Io that faces away from Jupiter, the large planet does not illuminate the moon's night side except for an extremely thin crescent outlining the edge of the disk at lower right. Another plume, likely from the volcano Masubi, is illuminated by Jupiter just above this lower right edge. A third and much fainter plume, barely visible at the 2 o'clock position, could be the first plume seen from the volcano Zal Patera. As in other New Horizons images of Io, mountains catch the setting Sun just beyond the terminator (the line dividing day and night). The most prominent, seen as a bright vertical line, is the edge of a plateau about 4.5 kilometers (15,000 feet) high, similar in altitude to the Colorado Rockies. Io itself has a diameter of 3,630 kilometers (about 2,250 miles). The image is centered at Io coordinates 4 degrees S, 165 degrees W. It has been processed to reduce contrast, in order to show details over the full 1000-to-1 brightness range of the original data.